The holiday region of Gstaad is considered one of the most luxurious destinations in Switzerland. Visitors to this region experience top quality and diverse services in all areas. Alpine authenticity, proudly maintained traditions and a touch of glamour give the destination a special flair which makes Gstaad so refreshingly different from the rest of the world. In spite of the brand’s enormous prestigious value, Gstaad has remained down-to-earth. Discretion and understatement underline the exceptional charm for which Gstaad is so valued. The foundation for the tradition as a luxury holiday destination was laid by the international schools, with L’Institut Le Rosey leading the way: since 1917, it has relocated its campus from Rolle on Lake Geneva to Gstaad for a period of 10 weeks every winter. With the John F. Kennedy School in Saanen and the Gstaad International School, the holiday region has two other renowned educational institutions. Generations of students, parents, relatives, friends and teachers have now become ambassadors of Gstaad’s elegant lifestyle all over the world. The construction of the Montreux Oberland Bahn (MOB) railway network which is now called the GoldenPass Line improved accessibility at the beginning of the 20th century and thus made a key contribution to the development of the tourism region. In spite of its rural flair, which is still characterised by cosy chalets, Gstaad boasts a series of tourism-related advantages that can be experienced discretely. Excellent service is always the main guiding principle in this respect. Luxury feels right at home in Gstaad. As an innovative hotspot of the luxury hotel sector, which is steeped in tradition, here even the most unusual wishes are fulfilled with a smile. Thanks to its extravagant architecture, the Gstaad Palace, a flagship among the Swiss luxury hotels, is considered a widely visible landmark of the destination. The Grand Hotel Park has decided to reinterpret the chalet architectural style. With modern esprit – influenced by the region’s traditions – it was possible to retain the building’s authenticity and to combine it with the most modern and elegant features. Le Grand Bellevue, 5* luxury, at the heart of Gstaad and on the Promenade itself, was fully renovated for his 100 year existence drawing understated chic and elegance with extraordinary comfort and unsurpassed facilities. The Wellness & Spa Hotel Ermitage in Schönried is the only five-star hotel with a year-round offering. Extensively renovated and extended in 2011, guests in this hotel experience a charming and varied catering concept, as well as the targeted focus on wellness and spa services. With the opening of The Alpina Gstaad in December 2012 five more brilliant stars illuminate Gstaad’s hotel firmament. It was the first new luxury hotel to be realised in the last 100 years. The guide Gault & Millau named the hotel as the hotel of the year 2013. Anyone who prefers to stay in a luxury apartment rather than at a hotel will also easily find what they are looking for in Gstaad. stroll and relaxing. Branches of world-famous luxury brands entice people in the village and in the hotels to have an exclusive shopping experience. The airfield in Saanen makes it possible to arrive by private jet. This is the starting point for sightseeing flights over the glacier area or excursions to the major cities of Europe. 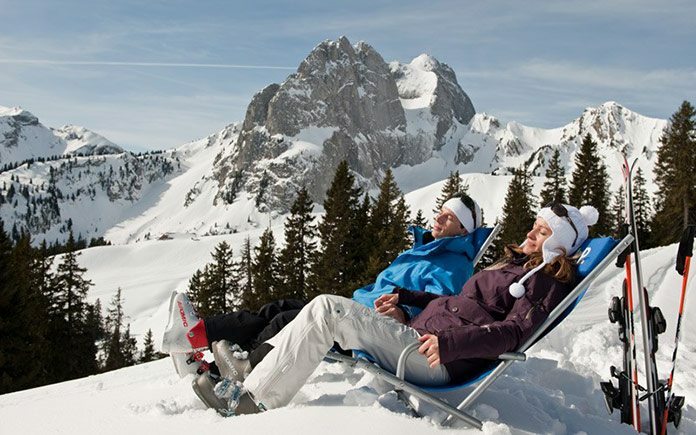 Gstaad offers fans of exclusive heli-skiing a total of six stations. compared to that of urban regions. The enormous selection of restaurants of various styles and the culinary masterpieces conjured up by numerous chefs, who have won awards from several restaurant guides, round off the stay in Gstaad in the finest possible way in the valley as well as in the mountains.